President Obama recently signed into law the US Commercial Space Launch Competitiveness Act (Space Act). Because it is the first time the US government has ever authorized exploitation of outside resources, this is arguably the most expansive property rights law ever passed. The Act will authorize private U.S. companies to own and sell resources they extract from objects in space. 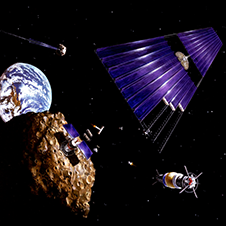 Supporters of the bill, such as Planetary Resources– a company planning to sell metals and water mined from asteroids- analogize the provisions of the law with international law governing fishing in international waters. The exploration and use of outer space, including moon and other celestial bodies, shall be carried out for the benefit and in the interests of all countries, irrespective of their degree of economic benefit or scientific development, and shall be the province of all mankind. In an attempt to avoid conflict with the 1967 Treaty, the Space Act limits itself to authorizing private citizen (as opposed to “national”) exploitation, and subjecting that exploitation to “international obligations of the United States.” This begs the question of whether allowing private exploitation is any better than allowing national exploitation. I would argue that it would in fact be worse. Without an explicit international treaty regulating commercial space resource exploitation, we will find ourselves in yet another one of Hardin’s Tragedy of the Commons situations in which these private individuals behave contrary to the best interests of the whole group by depleting resources that may become necessary due to current excessive degradation of Earth’s own resources. While this is only limited to US citizens, you can bet your bottom dollar that other spacefaring countries will follow suit passing their own domestic legislation mirroring the Space Act. Furthermore, analogizing these provisions with international law governing fishing in international waters is meritless. The United Nations Convention on the Law of the Sea (UNCLOS) provides a complex, binding framework that defines the rights and responsibilities of nations with respect to the resources of the world’s oceans, establishing guidelines for businesses, the environment, and the management of marine natural resources. Allowing a handful of companies to privatize and exploit these resources is certainly not “for the benefit and in the interests of all countries”. Thus, the Space Act clearly frustrates the purpose of the Outer Space Treaty making it a violation of international law. Next Homosexuality: Would You Die For It?